I have just completed the inspirational Business Growth Programme at Cranfield University. This was an amazing experience combining great lectures, fantastic tutors and interesting fellow participants from many different business sectors. It made me think about how we all juggle improving our career and professional skills with doing the day job. What is the best way to prioritise our time? Techniques that our coaching clients have found useful in the past are well trodden. Stephen Covey, popularized the concept of a Time Management Matrix for prioritizing by advocating the use of four quadrants to determine the tasks you “need” to do and deciding what should be made a priority. A number of clients have kept diaries during their coaching programme to log how they are spending their time. we have plotted this data on the used urgent vs important matrix which has always led to an “ah ha “moment and given them some good ideas for change. A weekly to do list, can be helpful if the items are prioritised. One client liked my idea of thinking about the real outcome, not just listing everything she needed to do. She aced this by bundling the priorities into 3 vitalthingstoachieveeachweek. Anotherclientwhowasswampedbybacktobackmeetingssignaledto all his colleagues that all 60 minute meetings were going to be cut to 45 minutes. And talking about effective meetings, we all know how decisive the stand up can be. At BGP, we were reminded of two old animal tales. Firstly we were all given stuffed monkeys to hang on the office door as a reminder of the cautionary tale of effective delegation. The original HBR monkey article suggested that people often ask your advice and input when you know a lot about a topic and you end up offering to deliver the work, write the slides, do the presentation and they are able to “pass the monkey” of the workload to you. So you have the extra monkey work load on your back now. so make sure you are not always accepting that monkey. BGP also reminded us of Mark Twain’s exhortation to eat a frog. So all the time management experts use this to encourage us to tackle the most weightiest work task as soon as we hit our desk in the morning as that is when our minds are clear and fresh. if we postpone and procrastinate, the job will get postponed, but it will be on our mind, so we lose focus on other topics Procrastination is the biggest time waster. So decide if you are going to tackle something and just do it! Measurable – The objectives should measurable in terms of the final result or standard required Aligned – Be linked to Individual/Team /Company Objectives. Be achievable but stretching. Remember that if the objective can be achieved too easily, then it will present little challenge. However, if the objective has little chance of being achieved (‘pie in the sky’), it will become de-motivational. Realistic – Objectives must be relevant to the key result areas of the job. Timetabled – How much, how soon? Any objective without a time constraint is just a wish list! Exciting – Fun objectives will always be achieved faster, and with less stress, than boring ones! The tips and techniques are endless and the golden rule is to ensure relevance to you and your world. 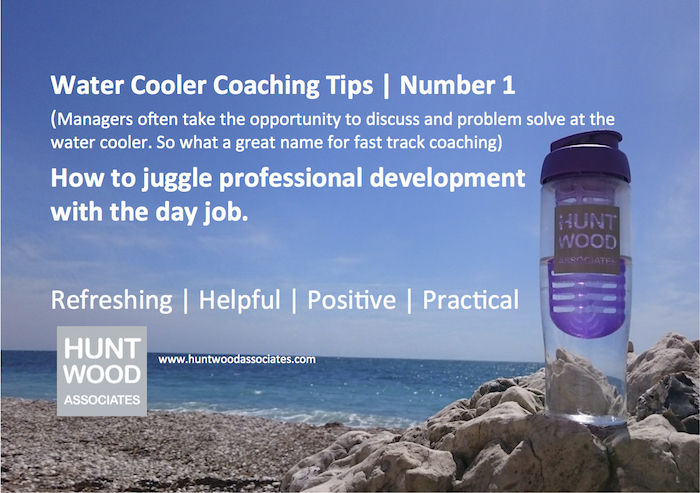 Exploring how to best juggle your time in your job is a great coaching topic, delivering very smart outcomes. I hope this gives you food for thought to free up some of your own time. You might choose to go cycling or socialising. You might choose to change your work/life balance. You might choose to do more work, but more efficiently. Or you might choose – as I did- to jump into executive education. It was inspirational and demanding, but well worth being more efficient with my time so that I could concentrate on personal development.